Going forward, we should refer to the NLL’s Head Coach of the Year award exclusively as the Les Bartley award. When you’re talking to NHL fans about awards, they talk about the Vezina, the Calder, the Lady Byng, and so on. Nobody talks about the “Goaltender of the Year” or “Rookie of the Year”, and similarly if you refer someone winning the Vezina, everyone knows what you’re talking about. That’s where we need to get with the Bartley award. When we went over our awards picks on Addicted to Lacrosse, I made a point of calling it the Les Bartley award, and same for my blog article about said picks. But most don’t. Oddly, the NLL’s own Tom Borrelli Award is almost always referred to by that name (or just “the Borrelli”), not as Media Person of the Year. 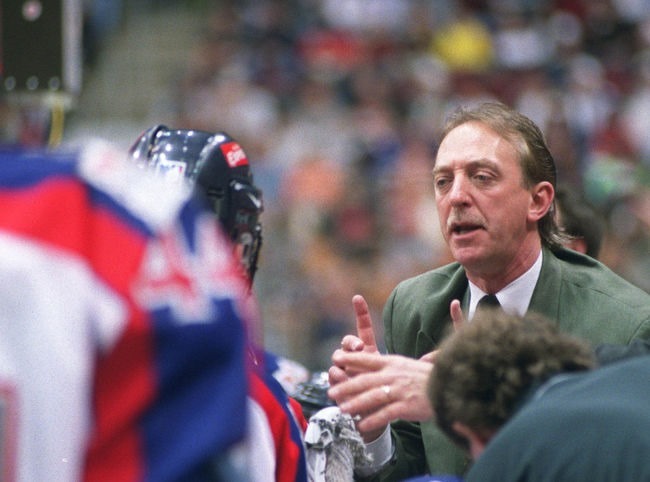 In the NLL world, Les Bartley’s name used to be synonymous with great coaching. The NLL honoured him for that reason by naming the award after him. But it’s been twelve years since Bartley died, less than twenty four hours after his Toronto Rock won the 2005 NLL Championship. That was long enough ago that many current NLL fans never saw Bartley and there are very few still-active players that played for him. He was by far the winningest coach in NLL history at one point, but with longer seasons and the fact that he died at only 51, at least a couple of coaches (Darris Kilgour, Derek Keenan) have surpassed those numbers. To let the name be forgotten would be a disservice to his memory and to the honour that the NLL has already given him by renaming the award. The page on the NLL website that lists all of the 2017 winners does include “Head Coach of the Year (Les Bartley Award)” but in my opinion, the page should read “Les Bartley Award (Head Coach of the Year)”. Does the fact that Georges Vezina has a trophy named after him mean that NHL fans remember the man or how he played? Probably not; he died almost 100 years ago. But his name lives on: every hockey fan knows the name Vezina and that he was an excellent goaltender. In ten or twenty years, most NLL fans will not remember Les Bartley’s style of coaching or much of anything else about the man. But if we consistently talk about the Bartley award and don’t let the name fade, they’ll know his name and know that he was a great coach. His name will also live on, as it should. This entry was posted in Opinion, Toronto Rock. Bookmark the permalink. I just read your article and was saddened. I didn’t realize that Les’s name has been dropped from the Coach of the Year award. It was such an honour for our family when we were first called about the award. To have Les’s name carried on would have made him so proud. He didn’t coach lacrosse for awards and was very humble. He loved lacrosse and his loved his players and fans. As you said, if his name fades so will his legacy for future players and fans. Hi Gloria, thanks very much for your comment. I need to clarify something: Les’s name has not been dropped from the NLL award – it is still officially called the Les Bartley Award. However when people talk informally about the award, they tend to simply refer to it as “Coach of the Year”. My article is suggesting that we explicitly call it the Les Bartley award (or just the Bartley award), even in casual conversation, explicitly so that Les’s name doesn’t fade from memory as time goes on.